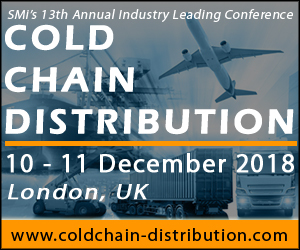 For the 13th successful year running, SMi are expanding the scope of the conference to cover all aspects related to cold chain distribution, including how best to maintain GDP compliance in the industry, as well as the optimisation of operating in emerging markets. The cold chain market was valued at USD 189.92 Billion in 2017 and is projected to reach USD 293.27 Billion by 2023. (MarketsandMarkets). Cold Chain Distribution will address the impact of the overwhelming digitalisation in the industry and how companies from biotech’s to pharma, need to adapt. The event also explores the crucial challenges of supply chain visibility and data integrity within the growing dynamic industry. This year, SMi are thrilled to announce our best speaker line-up to date, which will feature pharma companies who are the backbone of this industry. Hear from the latest confirmed speakers IATA, MSD SeerPharma (UK), GSK, Sanofi Genzyme Europe, MSF and more! Transporting healthcare products by air demands a rigorous logistical approach. If mishandled, the intactness of these products can be compromised by temperature changes during transportation. Here from the IATA as they discuss the updates on their pharmaceutical handling certification programme ‘CEIV’. The programme is a concentrated effort to improve the level of competency, as well as operational and technical preparedness which is urgently required to stop the alarming decline of air cargo’s market share of global pharmaceutical product transport. A global industry standard and a concerted effort to improve the level of competency, operational and technical preparedness for temperature-sensitive air freight shipments. Find out more about the IATA CEIV pharma certification program, including how to approach the issue of the pharmaceutical cargo community collaboration and the present global status, plus what the organisation does, how and why. For those looking to attend, there is currently a £400 early-bird saving, ending June 29th.